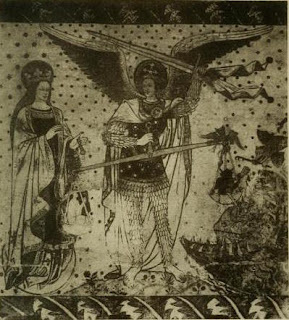 Now the reason why the Archangel Michael is called the Chief is the following: When God made the world he appointed a determinate chief to all creatures separately; viz., Lucifer for the demons; the sun for the stars; Mount Sion for the mountains; the river Jordan among rivers; the vine among trees; the dove among birds; the lion among beasts; the leviathan among fishes; Christ over mankind. Thus at that time the Archangel Michael was appointed in the chief place and supremacy over the angels of heaven; it is he who announces in the presence of God the intercessions which the saints make with Him; he is the archangel of the archangels; the star above stars; the brilliant fire: it is he who weeps and laments over the souls that are in hell; for when the folk of hell see the countenance of St. Michael the Archangel, they say: "O Michael, thou art our chief; thou art our king; thou labourest ever in our behalf." Then Michael makes them this reply: "I beseech the Lord for ever for the souls of mankind." Homily XXVII 'On the Archangel Michael' in R. Atkinson, ed. and trans., The Passions and Homilies from Leabhar Breac, (Dublin, 1887) 456-457. Abbot Attala of Bobbio, who died in 627, was said in his Life by Jonas to have wept copiously when a cross was brought to him on his deathbed. 'Greetings, kind cross' he said 'which bore the price of the world [and] which carrying eternal banners brought the medicine of our wounds. It is you who smeared with His blood came down from heaven into this vale of tears in order to save the human race'. Giles Constable, Three Studies in Medieval Religious and Social Thought (Cambridge University Press, 1995), 76. Content Copyright © Omnium Sanctorum Hiberniae 2012-2016. All rights reserved. Ultan quasi altan 'razor,' for his keenness and sharpness in, miracles and marvels. He used to be called 'the cleric of the children,' for after the (plague called) Buide Connaill every babe without maintenance was brought to Ultan, so that often fifty, or a hundred-and-fifty, of them were with him at the same time, and he himself used to feed them, i.e. the children of the women whom the Buide Connaill had killed. This is what Ultan used to do, to cut off the cows' teats . . . and pour milk into them, and the babes a-playing around him. Thus then he used to wend, with his gospel on his back, (hanging) without any strap to it!
" Yon 'cleric of the children,' who wends with his gospel on his back and no strap to it, in him let us put our trust that the plague may be taken from us." So envoys are sent from Diarmait to Ultan. Then was Ultan feeding the children when the messengers arrived, and they tell him their errands. "That is a shame," says Ultan, " that ye did not leave me alone till my right hand was free. My hand that is free, i.e. the left hand, I will raise it against these ships. But if it were my right hand no foreigner would ever invade Ireland." So that hence is (the proverb) "Ultan's left hand against the evil!" Thus F: Then was Ultan feeding certain children, with a bit of porridge in his lips and some of it on his finger, when the king's gillie arrived. Ultan spake not to the gillie, but uplifted his left hand. The feeding of his fosterlings by Ultan he wrecked, destroyed, stranded thrice fifty ships with his left hand. Had it been the right hand that noble Ultan raised against them from us hence no foreigner would ever have come here or there into the land of Erin. Not from a blow on anyone's face are all the clerics red: 'tis a little thing that whitens the visage of Ultan great-grandson of Conchobar. 'Tis great labour to strive for the height in the valley : to strive for perfection with the Son of God, this is what would make the cheeks white. Ultan was elected into the abbacy of Mochta in Louth, and before him Fursa had been put thereout. Isn't this picture of the saint with his gospel on his back, miraculously hanging without a strap, feeding destitute children and having others romping around him a wonderful image? 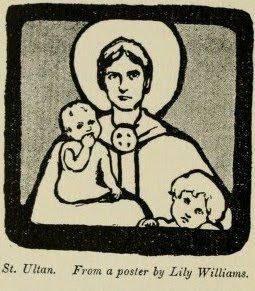 A hospital for babies in Dublin was dedicated to Saint Ultan, and in 1920 a book of poems and pictures was issued in its support. It is a most charming volume, and I have taken the picture of Saint Ultan above from it. You can read The Book of Saint Ultan online here. St. Balin or Balloin, of Tech-Saxon. The present holy man was a brother to St. Gerald, or Garalt, whose life has been given, at the 13th of March. The Martyrologies of Marianus O'Gorman, of Cathal Maguire, and of Donegal, record the festival of St. Balan or Balloin, at the 3rd of September. It is stated, that he came from England to Ireland, with his brothers, Gerald, Berikert and Hubritan, after the middle of the seventh century. He lived at a place, called Tech-Saxan, or the House of the Saxons, most probably because it had been founded or occupied by himself, or by his brothers, or by some of his countrymen, who accompanied him from England. This place is said to have been in Athenry Parish, in the Diocese of Tuam, and County of Galway. Castellan places this St. Balo in the province of Connaught, and his feast at the present day, as noted by the Bollandists. THE CARE OF BOOKS IN EARLY IRISH MONASTERIES. DURING the past fifty years much has been written about the learning and artistic skill of the monks of early Ireland. The evidence of this culture consists of records of the learning of particular Irishmen from the sixth to the ninth centuries, of the relics of their skill, and of the attraction Ireland had at this time for English students. The English crowded the Irish schools, although the Canterbury school was not full. The city of Armagh was divided into three sections, one being called Trian-Saxon, the Saxon's third, from the great number of Saxon students living there. Bede's account of the visits of Englishmen to Ireland, and of the willingness of the Irish to receive, feed, and lend them books is too well known for quotation here. In some respects the evidence of book-culture in Ireland in these early centuries is inconsistent. The well-known quarrel over the Cathach Psalter, and the great esteem in which scribes were held, suggest that books were very scarce; and the practice of enshrining them in cumdachs, or book-covers, points to the same conclusion. On the other hand Bede's statement that the Irish had enough books to lend English students by no means indicates a scarcity of them; nor does the fact that the ' Annals of the Four Masters ' record the deaths of as many as sixty-one eminent scribes, forty of whom belong to the eighth century. In some of the monasteries a special room for books was provided, for the ' Annals of Tigernach ' refer to the house of manuscripts ; an apartment of this kind is particularly mentioned as being saved from the flames when Armagh monastery was burned (1020). Another fact suggesting an abundance of books was the appointment of a librarian, which sometimes took place. Although a special bookroom and officer are only to be met with much later than the best age of Irish monachism, yet we may reasonably assume them to be the natural culmination of an old and established practice of making and using books. Such statements, however, are not necessarily contradictory. Manuscripts over which the cleverest scribes and illuminators had spent much time and pains would be jealously preserved in shrines ; still, when we remember how many precious fruits of the past must have perished, the number of beautiful Irish manuscripts still extant goes to prove that even books of this character existed in fair numbers. 'Workaday' copies of books would be made as well, maybe in comparatively large numbers, and these no doubt would be used very freely. Besides books properly so called, the religious used waxed tablets of wood, which might be confounded with books, and were indeed books in which the fugitive pieces of the time were written. A story about St. Ciaran tells us that he wrote on waxed tablets, which are called in one place ' polaire-Chiarain ' (Ciaran's tablets), while in two other places the whole collection of tablets is called 'leabhar', i.e. a book. Considering all things Bede was without doubt quite correct in saying the Irish had enough books to lend to foreign students. We know little of the library economy of the early Irish if, indeed, such a term may be applied at all in connexion with their use of books. But fortunately relics of two of their means of preserving books survive satchels and cumdachs. They used satchels or wallets to carry their books about with them. We are told Patrick once met a party of clerics, accompanied by gillies, with books in their girdles ; and he gave them the hide he had sat and slept on for twenty years to make a wallet. Columba is said to have made satchels. When these satchels were not carried they were hung upon pegs driven into the wall of the monastery chamber. One story in Adamnan's 'Life of Columba ' tells us that on the death of a scholar and book-miser named Longarad, whose person and books had been cursed by Columba, all the book- satchels in Ireland slipped off their pegs. A modern writer visiting the Abyssinian convent of Souriani has seen a room which, when we remember the connection between Egyptian and Celtic monachism, we cannot help thinking must closely resemble an ancient Irish cell. In the room the disposition of the manuscripts was very original. The few old satchels which are extant are black with age, and the characteristic decoration of diagonal lines and interlaced markings is nearly worn away. Three of them are preserved in England and Ireland : those of the Book of Armagh, in Trinity College, Dublin, of the Irish missal, in Corpus Christi, Cambridge, and of St. Moedoc's Reliquary, in the museum of the Royal Irish Academy. The Cambridge wallet is decorated with diagonal lines and circles ; leather straps are fixed to it, by which it was slung round the neck. The Armagh wallet is made of one piece of leather, folded to form a case a foot long, a little more than a foot broad, and two-and-a-half inches thick. The Book of Armagh does not fit it properly. Interlaced work and zoomorphs decorate the leather. Remains of rough straps are still attached to the sides. The second special feature of Irish book-economy was the preservation of manuscripts in cumdachs, or rectangular boxes, made just large enough for the manuscripts they are intended to enshrine. As in the case of the wallet, the cumdach was not peculiar to Ireland, although the finest examples which have come down to us were made in that country. They are referred to several times in early Irish annals. 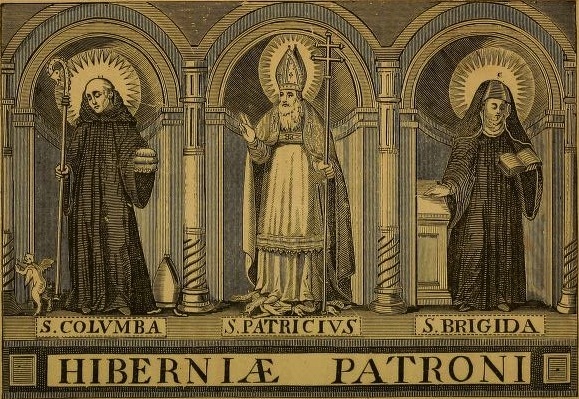 Bishop Assicus is said to have made quadrangular book-covers in honour of Patrick. In the 'Annals of the Four Masters' is recorded, under the year 937, a reference to the cumdach of the Book of Armagh. 'Canoin Phadraig was covered by Donchadh, son of Flann, king of Ireland.' In 1006 the 'Annals' note that the Book of Kells 'the Great Gospel of Columb Cille' was stolen at night from the western erdomh of the Great Church of Ceannanus. This was the principal relic of the western world, on account of its singular cover ; and it was found after twenty nights and two months, its gold having been stolen off it, and a sod over it.' These cumdachs are now lost; so also is the jewelled case of the Gospels of St. Arnoul at Metz, and that belonging to the Book of Durrow. By good hap, several cumdachs of the greatest interest and importance are still preserved for our inspection. One of them, the Silver Shrine of St. Patrick's Gospels which, by the way, did not belong to Patrick is a very peculiar case. It consists of three covers : the first, or inner, is of yew, and was perhaps made in the fifth century ; the second, of copper, silver-plated, is of later make ; and the third, or outermost, is of silver, and was probably made in the fourteenth century. The cumdach of the Stowe Missal (1023) is a much more beautiful example. It is of oak, covered with plates of silver. The lower or more ancient side bears a cross within a rectangular frame. In the centre of the cross is a crystal set in an oval frame. The decoration of the four panels consists of metal plates, the ornament being a chequer-work of squares and triangles. The lid has a similar cross and frame, but the cross is set with pearls and metal bosses, a crystal in the centre, and a large jewel at each end of the cross. The panels consist of silver-gilt plates embellished with figures of saints. The sides, which are decorated with enamelled bosses and open-work designs, are imperfect. On the box are inscriptions in Irish, such as the following : 'Pray for Dunchad, descendant of Taccan, of the family of Cluain, who made this ' ; ' A blessing of God on every soul according to its merit'; 'Pray for Donchadh, son of Brian, for the King of Ireland'; 'And for Macc Raith, descendant of Donnchad, for the King of Cashel.' Other cumdachs are those in the Royal Irish Academy, for Molaise's Gospels (c. 1001-25), for Columba's Psalter (1084), and those in Trinity College, Dublin, for Dimma's book (1150), and for the Book of St. Moling. There are also the cumdachs for Cairnech's Calendar and of Caillen ; the library of St. Gall possesses still one more silver cumdach, which is probably Irish. It was believed such books could not be injured. St. Ciarnan's copy of the Gospels fell into a lake, but was uninjured; St. Cronan's copy fell into Loch Cre, and remained under water forty days without injury; even fire could not harm St. Cainnech's case of books. Nor is it surprising they should be looked upon as sacred. The scribes and illuminators who took such loving care to make their work perfect, and the craftsmen who wrought beautiful shrines for the books so made, were animated with the feeling and spirit which impels men to erect beautiful churches to testify to the glory of their Creator. As Dimma says, 'they wrote them for God'. A festival to honour the Sons of Caimene is set down, in the Martyrology of Donegal, at the 1st of September. It seems probable, those holy brothers flourished, after the eighth century, as they are not contained, in that copy of the Martyrology of Tallaght in the Book of Leinster, at the Kalends of September, nor in that published by the Rev. Dr. Kelly, for which day entries are missing. Their particular names do not seem to be ascertainable.